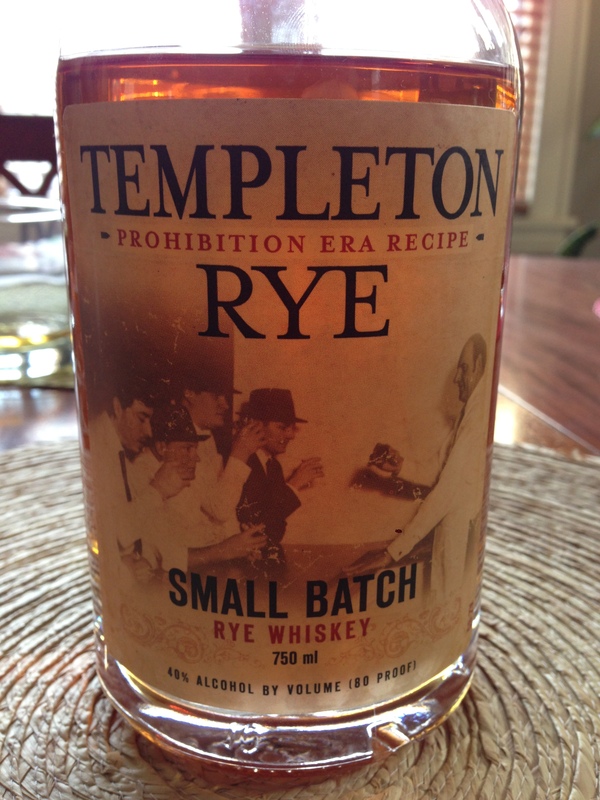 Is Templeton Rye, really a lie? Do you read the whiskey news? Of course you do, you whiskey slugger, you. Given that, you’ve probably heard recently of the troubles some “Small batch” whiskey producers are going through due to some…let’s call them inaccuracies of their marketing efforts. Your know the story: “We’re making the same whiskey that pappy used to make during the Prohibition Era.” And people have apparently enjoyed the story, because they are buying lots of these products. Are consumers victims if they buy a product based on the marketing and not because of the product itself? I will leave that up for debate amongst you all, but let me dive into some of the more technical aspects of these conversations that bother me a bit. A quick summary of the situation: Numerous distilleries of whiskey (Interestingly enough, primarily rye whiskies) have previously marketed their products as “Small batch” and are being sold with the suggestion that they are local products coming out of places such as Iowa, Utah, and Vermont. Through some surprisingly dedicated journalism, a good handful of stories are coming out about how most of these whiskies are actually produced out of huge distilleries like MGP-I in Indiana. Amongst the general outrage, a law firm is gearing up to attack the companies that buy what we term as “bulk” whiskey from a mega-distillery, perhaps do some blending of their own and then bottle it up and sell it as their own product. This is a practice called Private Labeling and is used in just about every product category you can imagine from food to clothing. And I can bet at some point you’ve probably stood in a store debating between two products that were created by the same company and now have two different labels on them. The solution being proposed is to force these private labelers to disclose on their labels where there product was distilled. The company that produces Maker’s Mark says that the traditional definition is a whiskey produced using “approximately 1,000 gallons or less (20 barrels) from a mash bill of around 200 bushels of grain“. Kentucky Bourbon Distillers, a producer of bourbon and rye whiskey, uses at most 12 barrels per batch for its small batch brands. George Dickel uses “approximately 10 barrels” of whiskey to make each batch of its Barrel Select Tennessee Whiskey brand. Second, let’s address the whole “local” issue. Because we live in America, and our alcohol laws are more concerned about controlling who drinks it rather than the quality of it, if you’re drinking American whiskey (or beer for that matter), it is most likely not made from local ingredients regardless of where it is actually distilled. Malt, that pivotal ingredient utilized for its sugars to feed to the yeast that turns it into alcohol will most likely come from the Upper Midwest. The barley that companies like Rahr Malting and Cargill utilize can come from all over North America. Therefore, part of the American beer or whiskey you a drinking could have actually come from Canada. Third, as a subpoint to the above, where the whiskey is distilled (most likely utilizing its non-local ingredients) will have no bearing on the quality, flavor, or uniqueness of the end product. Locality in American whiskey (or beer) doesn’t matter since we do not have unique regional styles (Reminder: Bourbon can be made anywhere in the U.S. as long as it’s primarily from corn). Compare this to Scotland, whose whiskies have distinct regional styles and you can easily distinguish between a whisky (spelling due to Scottish prefernces) made in the Islays compared to one made in the Highlands. If you truly want a local whiskey made from local ingredients, using old traditions and that maintains a distinct regional style, try Springbank. It’s one of the few distilleries that malts its own barley. Of course, a bottle of their 25-year old may set you back $600+. Additionally, the act of distilling (separating the alcohol from the other content of the mash to some degree) can be done in any environmental conditions with the same result because the things that truly affect the product like the type of still you use, the materials that still is made of, the temperature control of the still, and how you blend the cuts, are not constrained by the geographic location. The quality of the end product is a result of the quality of the ingredients and the skill that went into distilling it. This is theoretically easier to accomplish in smaller batches, but there are some large producers (MGP-I) that do a fantastic job in large batches. To summarize then, in America we don’t have any legal definitions as to what the term “Small batch” means, nor do we have anyway to verify how local a whiskey product is (not that it would necessarily give us an indication as to how it would taste). Oh, I almost forgot, we don’t have any definition as to what the words “Artisinal”, “Craft”, “Handmade”, or “Traditional”. Hopefully though, you as a consumer have seen these words on bags of potato chips and wised up that they usually mean absolutely nothing. Ironically, in the past marketers would shy away from these terms because they usually meant the product was inferior. Legally, we do have a definition for the phrase “Distilled by” however, which has actually never been used by any of the cited whiskey producers in the lawsuit who have instead used “Bottled by” or “Produced by” instead. Personally, I’m all for transparent labeling of any product and forcing whiskey producers to admit that they are really just private labelers is a good step. My own ventures recently into the Private Labeling world have given me a new perspective, but a lot of the craft distillers have pushed the envelope of having a good backstory a bit too far. However, we should also probably create a legal phrase that a producer can use to denote that they sourced their ingredients from local or regional growers. Until then, the true story behind a whiskey (or beer for that matter) will look more like a supply chain readout of your car manufacturer. Of course, the wine world already has this figured out this whole labeling thing so maybe we could just look over there instead? Or just drink more wine…but I may be biased in that.